2012 is my "learning the writing craft" year. And once a month, generally on the first Thursday of the month, I will share some highlights of what I learned. And here I go. Overuse of dialect can pull the reader from the story - but so can underuse of it. Combining several scenes into one can heighten tension. It's best to sprinkle setting in, rather than dumping. Emotional geography (created by the history and energy of the lives of the people there) can and should have a big impact on setting. The best way to describe a scene with all five senses is to be hypersensitive to setting in "the real world." The land is a living, breathing entity. Every place has a distinct vibe, built on geography, history, and all the people that inhabit it. That influences the characters and actions in the story. Often, setting detail does NOT need to come out in the first draft. Layer it in during revision - focus on the plot and characters first. 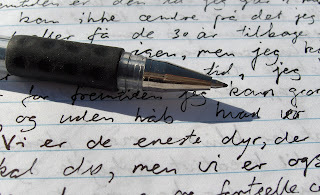 Good writing is the hardest form of thinking (Pat Conroy). You get your ideas by asking yourself what kind of situation you would be happy to sit down and write about every single week for seven or eight months (Maeve Binchy). Travel writers don't need to travel - in fact, some of the best write about the areas where they live. I hope you learned something as well! Watch this spot next month, where I'll share, among other things, what I've learned from Randy Ingermanson about the Snowflake Method through a free ACFW class. In general, characters are more memorable than plots - so work on them. Love this bit of information-- I have been overworrying about my plot and maybe this is where I should concentrate! "Good writing is the hardest form of thinking." Agreed!!! Wanted to let you know that you're the winner of Michael's book!!! Please send me an e-mail with your address. I might have it somewhere; not sure. I'll look. Great tips! Gonna have to email this link to myself so I can add it to my Yahoo "writing tips" file. :) Have a blessed and highly-educatinal weekend. I enjoyed reading what you learned in May about the craft of writing. You've got some great writing tips and so important for some of us who learned "old school" format, tags, etc. Thanks for sharing! I look forward to these monthly recaps of writing tips. Thanks for sharing them! I think I read the same article in The Writer that you did, about characters being more memorable than plots. But as I think back over my favourite novels, it's the plots that come back first. If I want to describe any of them, I wouldn't describe the characters. I'd say what happened and introduce the characters along the way. A strong character will stay in my mind, but always in the context of his/her story.